Yes! 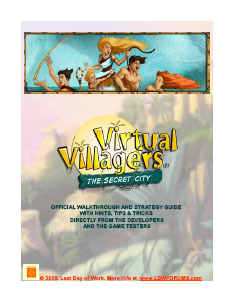 LDW has released an official game guide for Virtual Villagers: The Secret City. Please click the link below to obtain the guide in PDF format. Official LDW Virtual Villagers 3 Guide. Note: This guide requires either Adobe Reader or another PDF-compatible application. If you cannot view the PDF file in your browser, make sure that you have a compatible plug-in installed in your browser, such as Adobe Acrobat plugin. You can also try downloading the PDF file (right-click and save to your computer) and using the Adobe Reader application, if installed on your computer, or open it with Preview on a Mac. Click here to visit Adobe's download page. Transferring characters: Can I transfer my characters, food, tech points, or anything from previous Virtual Villagers games to Virtual Villagers: The Secret City? Stream: The stream won't stay cleared.